Major Cable Network is now casting pyrotechnic teams. The show is looking the best pyrotechnic teams in the nation for a competition where the best teams have a chance to win a large cash prize. Would you and your team of pyrotechnic artists like the opportunity to compete against the best? Do you think you have what it takes to create the most amazing fireworks displays this country has ever seen? If so, check tout the below casting notice and the flyer to get all the details on how to get on the show. 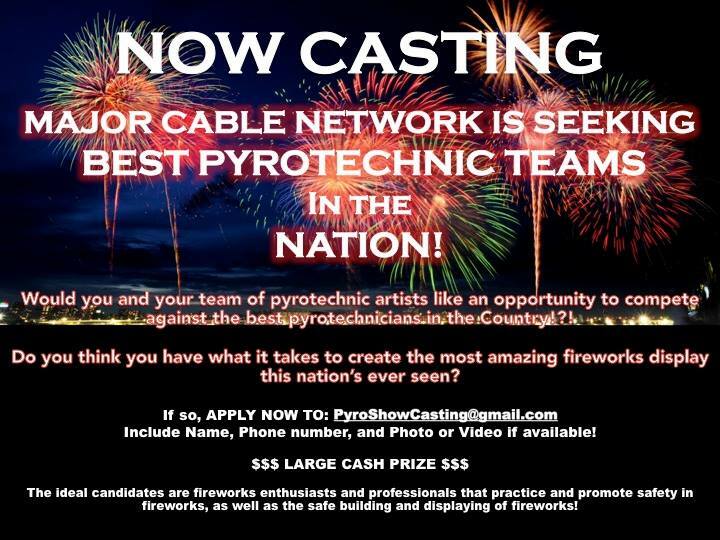 Major Cable Network is Seeking PYROTECHNIC ARTISTS. Currently casting experienced enthusiasts and professional teams for a large new competition series. Winner receives a Large Cash Prize. Include, Name, Phone Number, and Photo or video if available! NO DM’s, please.